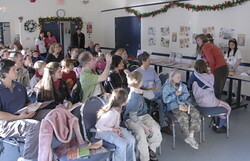 I launched my new book this past Saturday at the Vancouver SPCA shelter. “The Truth about Rats (and dogs)” is the second novel in a series the SPCA asked me to write about kids and animals. The first book, “Dog House Blues,” which came out last year, was also launched at a shelter event. I had three dogs as special guests at that one (rats, of course, at this one). The highlight of last year’s event was when the dogs all ran to the front of the room where I’d been doing my reading, and my dog, Dylan, immediately (and messily) drank up my whole glass of water. The kids thought that was hilarious. The highlight of the recent launch was probably when George, the rat, escaped from my hands and scampered onto my back, where I couldn’t reach him (see above photos). I’d like to think the best part was when I read from my book, but as usual, I was upstaged by the non-human guests! You can read a different perspective on the launch and see more photos at www.cwillbc.wordpress.com. This entry was posted on December 4, 2006 at 10:16 pm and is filed under animals, books, kidlit, rats. You can follow any responses to this entry through the RSS 2.0 feed. You can leave a response, or trackback from your own site. I had a great time at your book launch and would agree that it was pretty funny when George ran up your back. Such scene stealers these little guys are. But you have a very relaxed, natural presence too and it was a pleasure to hear you read! Thanks, Heather! I do enjoy reading — especially when the kids (like the ones in the front row) seem so engaged in the story. Sounds like fun, sorry I missed it. My daughter Jasmine had 2 pet rats in her class one year at school and all the kids enjoyed their company especially when they had babies! They too managed to escape on occassion. The kids also enjoyed taking turns bringing them home on the holidays. It was a great experience for the kids who could not have pets of their own at home. Having animals in the classroom can be a really positive experience for kids. I hope the teacher was able to find homes for all the baby rats afterward! (animal shelters like the SPCA end up housing and trying to find homes for so many unwanted animals each year, they’d prefer teachers promoted the spaying and neutering of pets). It’s nice to see rats overcoming their bad rap, though.